The Gallery relies on your generosity to achieve our institutional mission, and we invite you to join our circle of supporters with a gift to the Gallery’s Annual Fund. 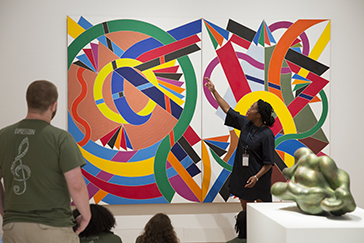 Your financial contributions directly enhance the quality of our exhibitions, programs, and visitor experience. Please consider making an online gift to the Yale University Art Gallery’s Annual Fund. A contribution to the Annual Fund is one of the most direct ways to support the Gallery and the free resources it provides. Gifts sustain the Gallery’s exhibitions, programming, and educational offerings and ensure the continued care of the permanent collection. Our ability to provide free admission, free programs, free tours, and free membership is the result of our donors’ generosity.